The Army uses many different kinds of wheeled vehicles. Most of the vehicles fall within a few basic groups, but they differ in appearance. The type of unit you are assigned to will determine the type of wheeled vehicles you will work on. In an infantry unit, most of the vehicles will fall within the general purpose category, such as ¼-ton trucks, 1 ¼-ton trucks, 2 ½-ton cargo trucks, and so forth. If you are in an engineer unit, most of your work will probably be on dump trucks. If you are in a transportation unit, you may be working on cargo trucks, truck-tractors, or semi-trailers most of the time. The wheeled vehicles discussed below represent some you will see most often, but all military vehicles are not listed. To list all the vehicles used in the Army would take many pages. The ¼-ton, 4x4, utility trucks are designed for use on all types of roads and cross-country terrain in all weather conditions. The vehicle has four driving wheels; front-wheel drive may be engaged when road and terrain conditions require. It is powered by a four-cylinder, in-line, liquid-cooled, gasoline engine and has four-wheel hydraulic service brakes and a mechanical hand brake that operates with a contracting band on the transmission-transfer brake drum. Wheels are individually suspended on coil springs. The body is of unitized construction. 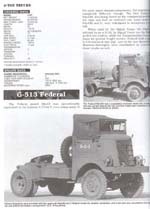 The M151, M151A1, and M151A2 utility trucks are general purpose personnel or cargo carriers. Including the driver, the truck provides space for four soldiers. The M718 and M718A1 front line ambulance trucks are designed to carry ambulatory and litter patients. The cargo area is 18 inches longer than in the utility vehicles, and the top is 5.3 inches higher. The M151A1C and M825 vehicles are equipped with 106-mm recoilless rifles and carry six rounds of ammunition and the weapon tools needed to function as a mobile weapon system. These ¾ ton and 1 ¼ ton commercial trucks are designed for use on all types of roads and highways in all types of weather. In addition, they are designed for infrequent off-road operations over selected terrain with most of the operations on primary and secondary roads. CUCVs are capable of intermittent, hard-bottom fording to a depth of 20 inches (51 cm) at 5 MPH (8 KPH) for not less than approximately three minutes without stalling, causing permanent damage to components exposed to water, or requiring any immediate maintenance to continue operation. CUCVs have an automatic transmission with three forward speeds and one reverse and a 379 cubic-inch displacement (6.2-liter) V-8 diesel engine. The braking system uses hydraulically activated, power-assisted front disc brakes and rear drum service brakes. The M1009, ¾ ton, utility truck is a general purpose personnel/cargo carrier. It provides space for four people with equipment. It is equipped with a 100-amp/12- to 28-volt electrical system and a communication kit. 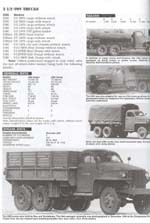 The M1008, 1 ¼ ton, cargo truck is a general purpose carrier. It can be equipped with side racks, seats, and a cover for carrying troops. The M1008A1 has provisions for communication equipment, and the M1028 has provisions for carrying communication shelters. The M1010, 1 ¼ ton ambulance carries four litter patients or eight ambulatory patients. The litter compartment has an air conditioner, a fuel fired heater, and a gas particulate filter unit. This 1 1¼ ton, general purpose vehicle has a dual-body configuration with six wheels and selectable two - or six wheel drive. Coordinated four-wheel steering of the front and rear wheels is provided. It is powered by a 3-53 Detroit Diesel engine, mounted behind the driver's compartment, and has a four-speed, manual transmission. It is equipped with a six-wheel hydraulic braking system. With its all-aluminum, watertight body, it is capable of swimming calm, inland waterways. 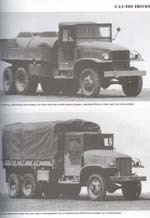 The M561 cargo truck may be used for carrying personnel or cargo. It is also used for carrying communication shelters. The M792 ambulance is designed for three litter patients. It is equipped with warm-air ducts and an insulated canopy. The 1 ¼-ton HMMWV is designed for use on all types of roads and cross-country terrain in all weather conditions. The vehicle, powered by a V-8 diesel engine, has four driving wheels, a three-speed power transmission, and a constant four-wheel drive. It is equipped with four-wheel, hydraulic-assist, disc brakes and power steering. The basic truck may be configured for a wide variety of functions. The M998 and M1038 utility trucks are multipurpose vehicles. They may be equipped with covers for either two-man or four-man operation. The M1038 is equipped with an electric winch. The M996 ambulance truck has an expandable top to increase the litter capacity from two to four. The M997 ambulance truck has a four-litter capacity. It is equipped with Air Conditioning for patient comfort. The M1025 and M1026 armament carriers are used to transport, mount, and operate the M2 and M60 machine guns and the MK19 grenade launcher. They are equipped with a hard top and a weapons mount. The M1026 is equipped with a winch. The 2 ½-ton series of vehicles is designed for use on all types of roads and cross-country terrain in all weather conditions. It is a six-wheel-drive vehicle, powered by an in-line, six-cylinder, multifuel engine, with a five-speed manual transmission and two-speed transfer case. It has six-wheel, air-assisted hydraulic brakes. The front axle uses leaf-spring suspension, while the rear axles are mounted together on a bogie-type suspension system. All vehicles in-this series use the same basic chassis with minor differences in length and power take-offs. The M35A2 cargo truck is the most familiar vehicle of the series. It has a steel cargo bed and may be equipped with side racks, troop seats, and a canvas cover. It is used for carrying cargo or personnel. It may be equipped with a winch. The M342A2 dump truck is used for hauling dirt, sand, gravel, and so forth. It may also be equipped with troop seats and a cover for carrying personnel. It may be equipped with a winch. The M109A2 van is used for housing mobile shop equipment, such as machine shops, electronic repair shops, and so forth. The M49A2C and M50A2 tanker trucks have a liquid capacity of 1,000 gallons. They are equipped with engine-driven dispensing pumps and all necessary hoses and fittings for pickup or dispensing. The M49A2C is used for fuel transport, and the M50A2 is used for water. The 5-ton series of vehicles is designed for use on all types of roads and cross-country terrain in all weather conditions. It is a six-wheel-drive vehicle, powered by a six-cylinder, in-line, multifuel or diesel engine, with a five-speed (manual or automatic) transmission and two-speed transfer case. It has six-wheel air brakes or air-assisted hydraulic brakes. The front axle uses leaf-spring suspension, while the rear axles are mounted together on a bogie-type suspension system. It uses hydraulic-assist power steering. All these vehicles use the same basic chassis with minor differences in length and power take-offs. The M39A2-series has a multifuel engine, manual transmission, and air-assisted hydraulic brakes. The M809-series has a diesel engine, manual transmission, and air-assisted hydraulic brakes. The M939-series has a diesel engine, automatic transmission, and air brakes. Also, it has a one-piece, tilt-forward hood and fender assembly and an improved cab. Except for the differences listed above, all models are basically the same. The following illustrations show the M809-series vehicles, but the descriptions apply to all three series. 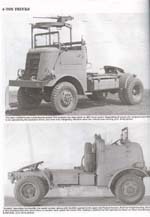 The M54A2/M813/M924 cargo truck has a steel cargo bed and may be equipped with side racks, troop seats, and canvas cover. It is used for carrying cargo or personnel and may be equipped with a winch. The M51A2/M817/M929 dump truck is used for hauling dirt, sand, gravel, and so forth. It may also be equipped with troop seats and a cover for carrying personnel and a winch. The M291A2/M820/M934 expansible van is used for electronic equipment, electronic shops, or working space. The M543A2/M816/M936 wrecker is used for recovery, maintenance, and lifting operations. It is equipped with a hydraulic crane, front and rear winches, outriggers, and all necessary equipment for recovery or towing operations. The M52A2/M818/M931 tractor truck is used as the prime mover for a variety of semitrailers, including stake-and-platforms, vans, tankers, low boys, and so forth. The M915 series of vehicles is designed for use on all types of roads and limited off-road operation in all weather conditions. It is powered by an in-line, six-cylinder, diesel engine with a 16-speed semiautomatic transmission or 5-speed full automatic transmission. It has air-actuated brakes and hydraulic-assist power steering. The front axle uses leaf-spring suspension, while the rear axles are mounted together on a bogie-type suspension system. Some models have a non-driven "pusher" axle, mounted ahead of the rear axles. 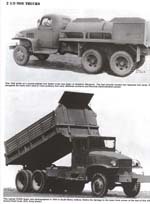 The M915 and M915A1, 6x4, line haul, tractor trucks are used for hauling a variety of semitrailers, including stake-and-platforms, vans, tankers, and so forth. They have no front-wheel drive and are intended for operation on improved roads only. The M915A1 has a five-speed transmission. The M916, 6x6, light equipment transporter, tractor truck is used for hauling a variety of semitrailers both on and off the road. It is equipped with a winch. The M920, 8x6, medium equipment transporter truck is used for hauling heavier loads and equipment on and off the road. It is equipped with a pusher axle and winch. 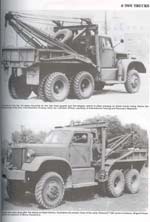 The M917, 8x6, 20-ton, dump truck is used for carrying dirt, sand, gravel, and so forth. 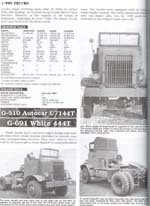 It is equipped with a pusher axle. The M918, 6x6, bituminous distributor truck is used for spreading bitumen for road construction and similar projects. The M919, 8x6, concrete, mobile mixer, truck is capable of on-site mixing of up to 8 cubic yards of concrete. The M911, 8x6 tractor truck, commercial, heavy equipment transporter (C-HET) is the prime mover for use with the M747 semitrailer. It is designed for primary and limited secondary road use. It is powered by a V-8, turbocharged, diesel engine with a five-speed automatic transmission and two-speed auxiliary transmission. It has hydraulic-assist power steering and an air-operated brake system. It is equipped with two winches for loading and off-loading equipment. With the M747, it is capable of hauling up to 60 tons. The HEMTT series of vehicles is designed for use on all types of road and cross-country terrain in all weather conditions. It is powered by a V-8 diesel engine with a four-speed automatic transmission and two-speed transfer case. It has leaf-spring and equalizer beam suspension with hydraulic-assist power steering on both front axles and eight-wheel, air-actuated brakes. The M977/M985 cargo trucks are general purpose carriers with a rear-mounted materials-handling crane. They are used for resupply of ammunition to forward units. Some trucks are equipped with a winch. The M978 fuel-servicing truck has a liquid capacity of 2,500 gallons. It is used for supplying fuel to units in forward positions. Some trucks are equipped with a winch. 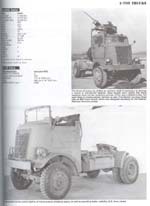 The M983 tractor truck is capable of pulling most Army semi-trailers. It is equipped with a winch, and some trucks have a materials-handling crane. The M984E1 recovery truck is equipped with two midship winches and a rear-mounted recovery crane. It is capable of lifting and towing most Army tactical trucks. Trailers, like trucks, are made to transport various types of cargo. The following trailers have two wheels and are designed to be towed by a vehicle with the same general tonnage rating. The M416/M416A1 ¼-ton trailer is designed to be towed by an M151-series vehicle. The body is of one-piece, welded construction and will carry a 500-pound load. The M416A1 has lunette-actuated hydraulic brakes. The M101-series, ¾-ton trailer is designed to be towed by ¾- and 1 ¼-ton vehicles. It is equipped with side racks, cover, and drop tailgate. The M101A1 has lunette-actuated hydraulic brakes. 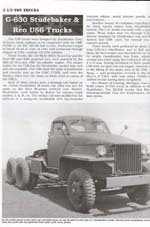 The M105-series, 1 ½-ton trailer is designed to be towed by the 2 ½- and 5-ton vehicles. It is also equipped with side racks, cover, and drop tailgate. It has air-actuated hydraulic brakes. The M149-series water trailer is designed to be towed by the 2 ½- and 5-ton vehicles. It has a 400-gallon capacity, with either a fiberglass or stainless steel tank. It uses air-actuated hydraulic brakes. Semi trailers are easy to recognize because they have wheels at only one end. On the other end, there is a fifth wheel upper plate with a pin that engages the fifth wheel of a tractor truck for towing. Also, near the fifth wheel end, there is a landing gear that can be lowered to support the trailer when it is not connected to a tractor. 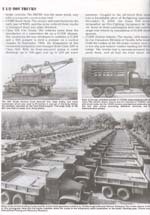 Several different types of semi trailers used by the Army are discussed in the following paragraphs. The M871, 22 ½-ton break-bulk/container transporter is designed to carry either conventional or containerized cargo. It is towed by the M915-series or 5-ton tractor trucks. It is equipped with air brakes and removable side racks. The M872, 34-ton break-bulk/container transporter is similar to the M871. It is longer, has a larger cargo capacity, and is equipped with three axles. 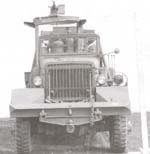 The M747, 52 ½-ton, heavy equipment transporter is used to transport combat vehicles and other heavy equipment. It is towed by the M911 tractor truck. The M967-series, 5,000-gallon tankers are designed to transport and dispense automotive and aviation fuel. They are towed by the M915 and 5-ton series of tractor trucks. The M128A1 and M129A1, 12-ton vans are multipurpose cargo and supply vans. They are towed by the 5-ton or M915-series of tractor trucks. The M129A1 vans have windows and interior lights.